Jim Clark scored a lucky win at the Belgian Grand Prix, when all the other contenders ran out of fuel before the finish. The Spa circuit , at 282 miles, was one of the longest races of the season, and fuel consumption was always going to be an issue. 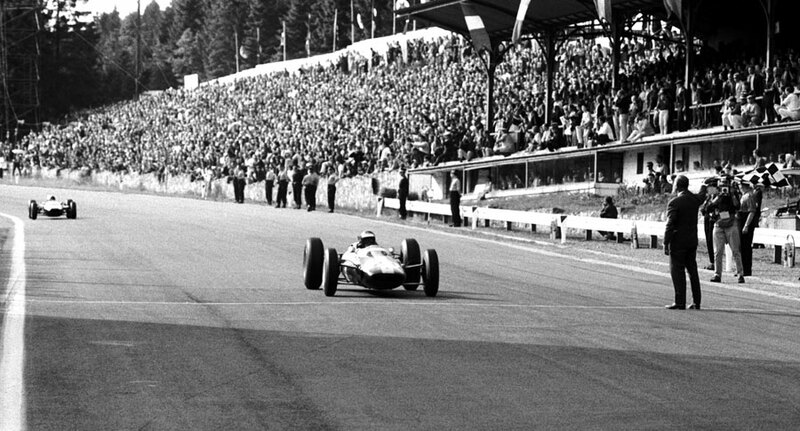 One of the oldest and most magnificent of the grand prix circuits, Spa swept through the pine forests of the Ardennes, with drivers hitting average speeds of 130 to 140mph. Dan Gurney took pole position in the Brabham, with Graham Hill and Jack Brabham alongside him. It was Peter Arundell, however, who roared past everyone at the start to take an early lead, but by the end of the first lap Gurney was in front with John Surtees in second. Surtees then broke the lap record in snatching the lead for one lap, before engine trouble finished his race, leaving Gurney to pull away in first. Hill and Clark took part in a private battle for second, passing and re-passing each other in a wheel to wheel struggle, closely followed by Bruce McLaren in the Cooper Climax. By the 19th lap, the flying Gurney was 32 seconds ahead of his rivals, looking seemingly unstoppable. However, with just two laps to go, he appeared to vanish on the far side of the course, and Hill swept through into the lead. Gurney eventually reappeared and crawled into the pits, desperately in need of fuel, which his mechanics didn't have ready. He therefore rejoined the race, only to come to a complete stop a short distance later. Clark's Lotus began to overheat, so he made a five-second pit stop, after which he was in third behind McLaren. As the cars headed into the last lap, Hill was in the lead, but he too ran out of fuel, leaving McLaren out in front ahead of Clark. McLaren was on the last dregs of his fuel and came stuttering round the last corner, hoping he could coast over the line. What he didn't expect was Clark to come up behind him, still going at full speed, and overtake him just on the line, before he too ran out of fuel on his victory lap. McLaren, his face spattered with dried blood after being hit by a stone from Hill's wheel, explained what happened; "I went past Hill, who was pushing his car, then found my Cooper was misfiring - obviously running out of fuel. Gurney came past, then stopped on the track. I managed to keep going and coasted round the last hairpin, thinking I had won, and that Clark was still in the pits. But then he just flashed past me right on the line - I couldn't do a thing about it. It was the most fantastic situation I have ever seen in a race." Clark was now the clear leader in the championship with 21 points, seven points ahead of Hill.